Small town, big stories...with Ozark snark! This little ball of fur is our newest acquisition. He was rescued from running around in traffic by my cousins. Filthy, with matted fur and lousy with cockleburs, he had no collar, no chip. The pound wouldn't take him since they hadn't picked him up themselves, so we decided he should come live with us. In this pic, my husband and cousins are trying to cut out the worst of the burs. Even with our best efforts, Charlie needed professional help. Charlie is a dear little fellow and a welcome addition to the family. After a trip to the vet to bring his shots up to date and have him neutered, he's a happy, healthy boy. It's hard to believe the difference in the before and after pictures, isn't it? Not that it matters, but any guesses what kind of dog he might be? 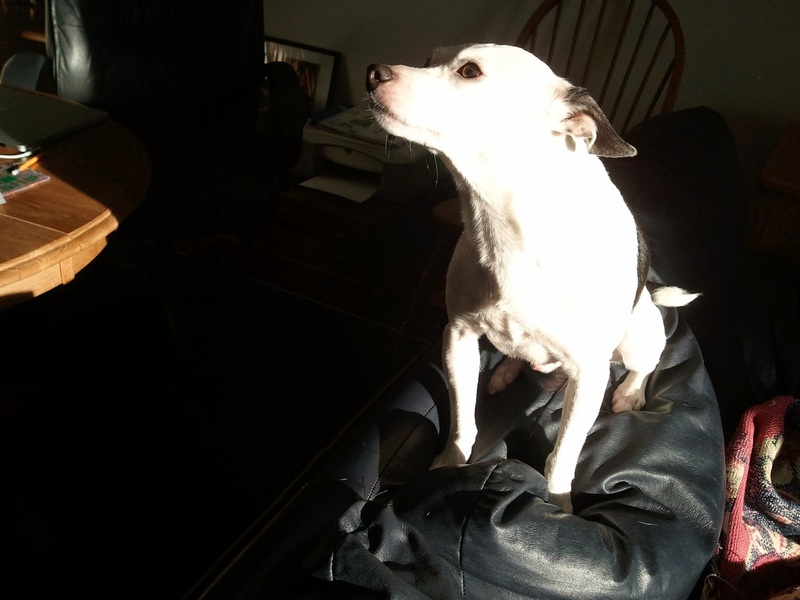 Mack, our rat terrier, has been with us since 2005. 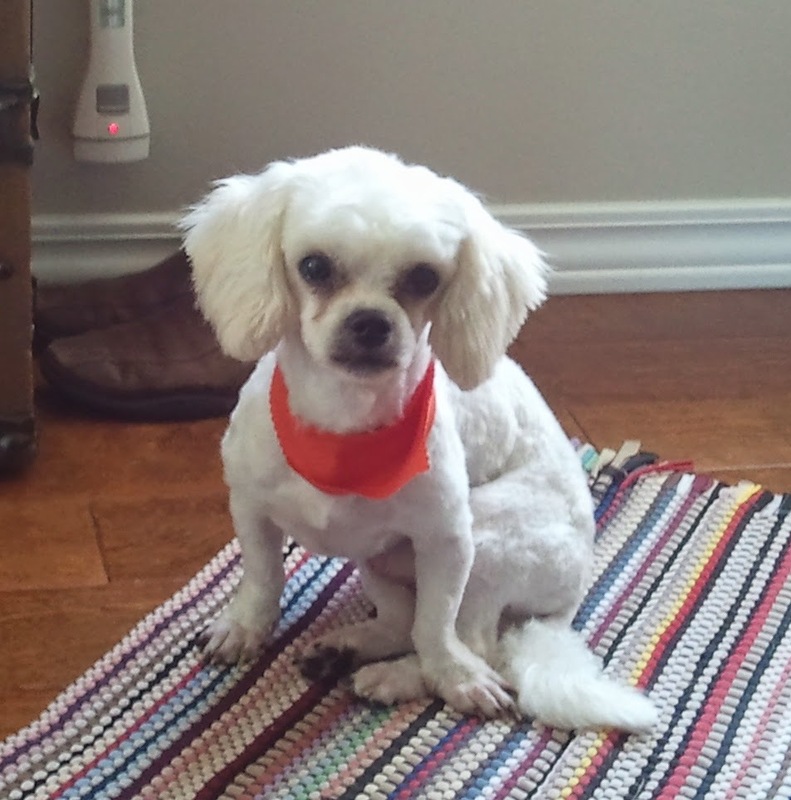 He was a puppy mill reject, born with a surgically repairable defect. The "breeder" was going to put a bullet in his head, but my soft-hearted brother-in-law said he'd take him. Unfortunately, my sister and her husband already had a dog who did not welcome Mack. So he came to our house and stayed. We're so glad. He is a sweet dog and smart as a whip. He even understands when we spell special happy words like W-A-L-K or not so happy ones like B-A-T-H! 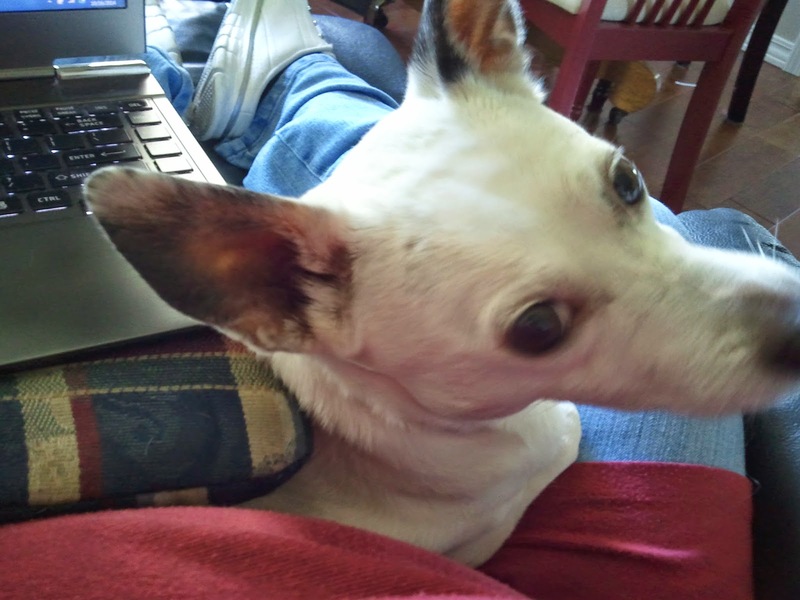 Terriers are known to be active types, but Mack loves to snuggle in the "writing chair" with me for hours. He even makes a great laptop pillow. My niece found Harry in the woods, tied to a tree with no food or water. Someone had left him to die. He came live with us because my sister, who already had several rescue dogs, simply didn't have room. Once Harry realized he didn't need to guard his food bowl constantly, he was a lively, happy boy who came running to claim my lap each morning. Unfortunately, he wasn't with us long. After a sudden catastrophic illness, we said a tearful goodbye to him in January 2014. I found Susie at the pound in 1997. 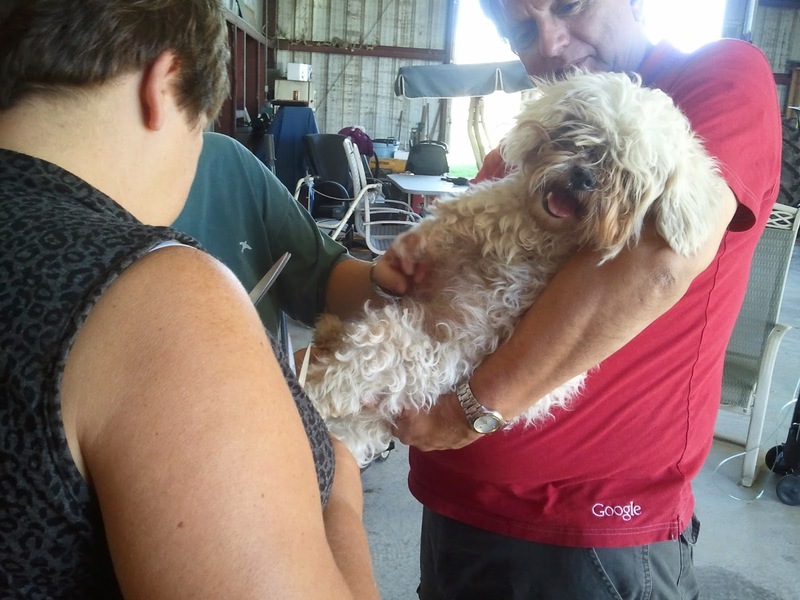 She'd been dropped off by some truckers because she was sick and they couldn't stay in one place long enough to take her to the vet. She was a fearful girl at first. Seeing a man in a ball cap would turn her into a shivering puddle. It took her six months to warm up to my husband, who is the kindest of men. 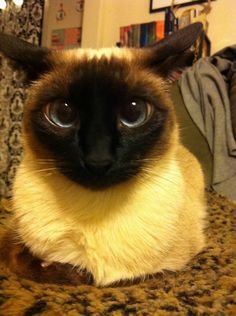 When we took her to the vet, he said she was at least 5 years old. She was my constant companion for another 12. Don't be afraid to adopt an older pet. They can be wonderful. 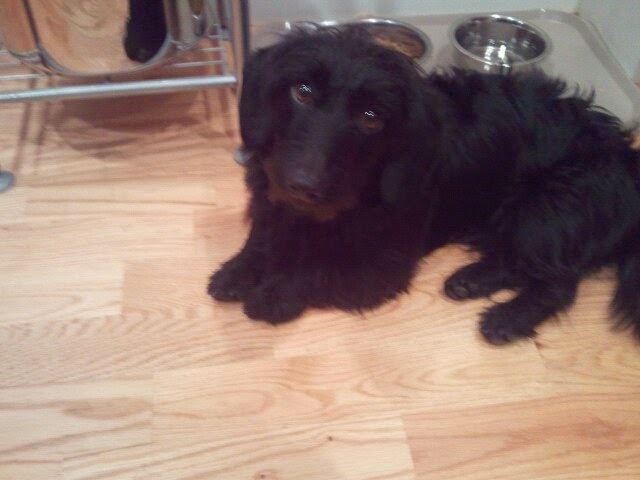 Also, if you are considering adopting a shelter animal, look for a black one. Statistically, black dogs and cats are last to be adopted and are more likely to be euthanized than their lighter colored counterparts. Pets are heartaches waiting to happen. We miss them so when they are gone. But the joy they bring to our lives while we have them is worth the pain of our parting. I hope you've been blessed by some four legged friends. 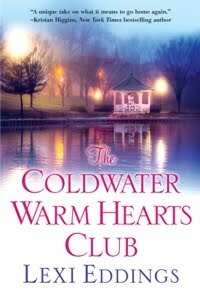 Lacy Evans, the heroine in The Coldwater Warm Hearts Club, says "It's sort of like being a Republican or a Democrat. You're either a dog person or a cat person. Dogs are loyal, faithful and pathetically eager to please. Cats never let you forget what an honor they are bestowing by letting you serve them." Is it any wonder I made sure Lacy inherited a cat? 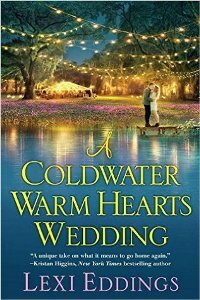 "Sure to appeal to fans of Debbie Macomber and Susan Wiggs...a perfect read for a quiet afternoon!" Copyright © 2015 Lexi Eddings. All rights reserved.. Simple theme. Powered by Blogger.